We have but one celery plant in our garden, yet it's enough to supply all our celery needs. 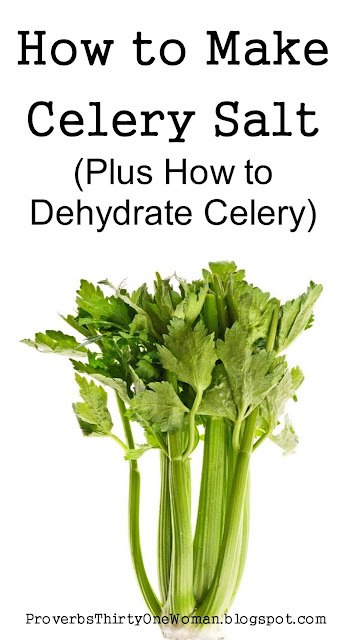 That's because celery is a "cut and come again" plant, meaning you can cut off the stalks and new ones will grow in their place. Given that our plant is prolific, and given that it's getting huge now that it's spring, I recently cut all the larger stems off and decided to preserve them as celery salt (SO delish on meat and eggs!). 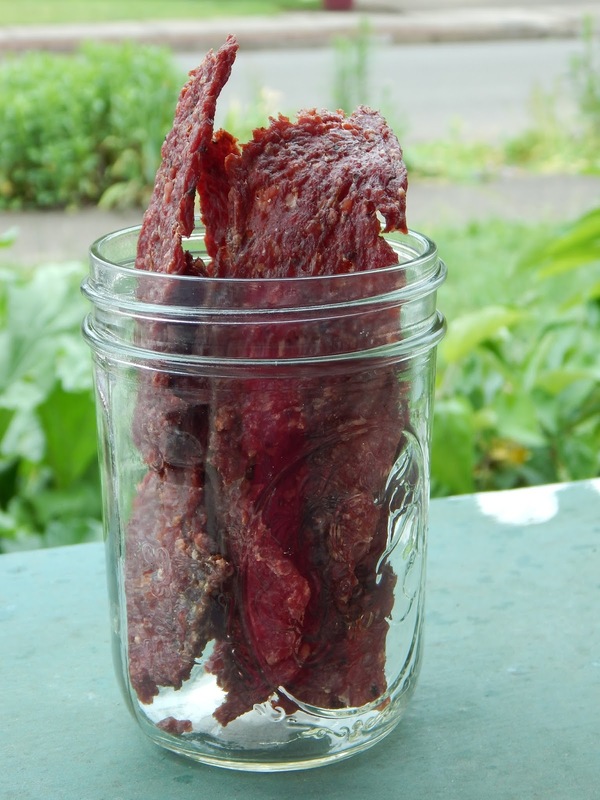 I also made some plain dried celery. Dehydrating the celery was easy: I cut up the stalks, laid them on dehydrator trays (covered with fruit roll sheets that prevent small pieces from falling through the trays' holes), set the dehydrator to 135 degrees F., and waited for the pieces to dry. It only took about 5 hours. These chopped, dried, stalk pieces are perfect for adding to soups and stews, come cool weather. But I also had a ton of celery leaves I wanted to do something with. When I cook with fresh celery, I normally chop up the leaves and add them to whatever I'm cooking. They add celery flavor, but not crunch. So I dehydrated the leaves, too - and could have left them as is, to also add to soups and stews. But instead, I made really yummy celery salt. 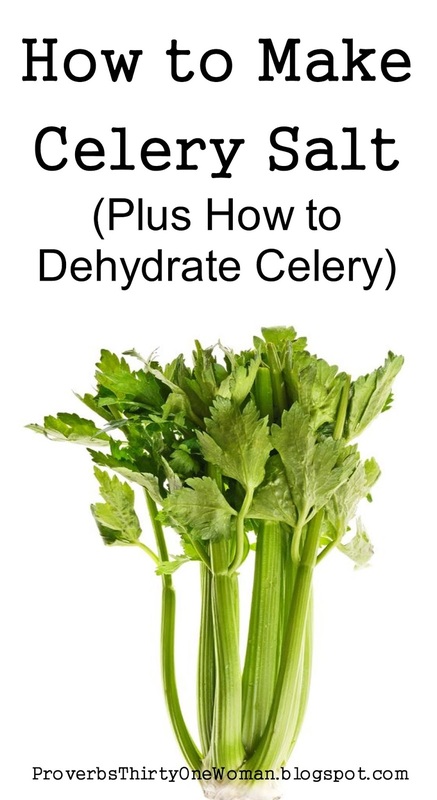 You can make celery salt with dried celery leaves, dried celery stalks, or even with celery seeds (but not seeds designed for planting in the ground; they may be treated with chemicals). For salt, I recommend sea salt, since table salt or iodized salt will impart a less pure flavor. You may use either coarse or fine salt. 1. Powder dried leaves, stalks, or seeds. I used a food processor, but you could use a blender. 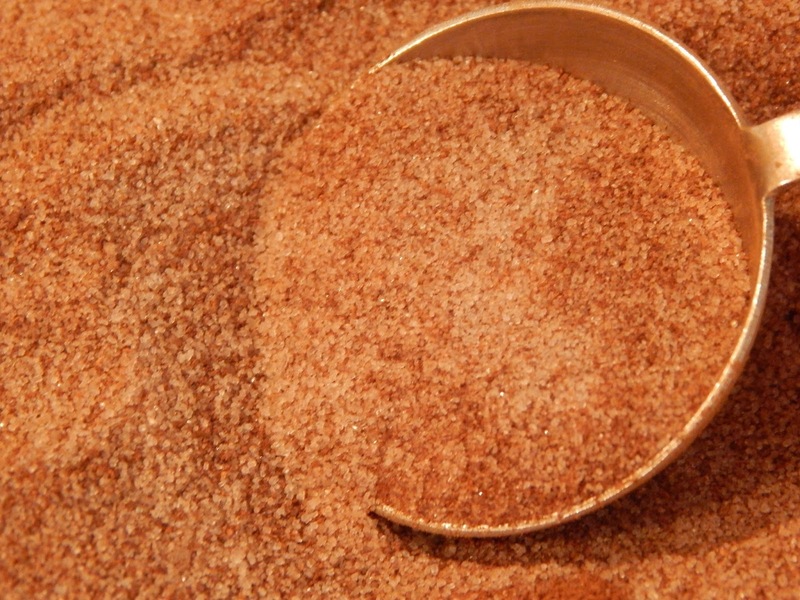 If you're using leaves, a mortar and pestle, or even your fingers, will also do the trick. 2. Combine the salt and celery powder. The ratio you use is a matter of personal preference. I used half and half (equal parts), but some people prefer a 1:2 ratio, using more of whichever flavor, salt or celery, they want to emphasize. 3. Pour the celery salt into an air tight container, like a glass jar with a lid. Watch this video to see just how easy it is! Now is a great time to make homemade, DIY sauerkraut. It's healthier than store bought (because all those good probiotics are still in there, whereas most store bought sauerkraut is "dead" of probiotics), cheaper than store bought, and fun and easy, too. 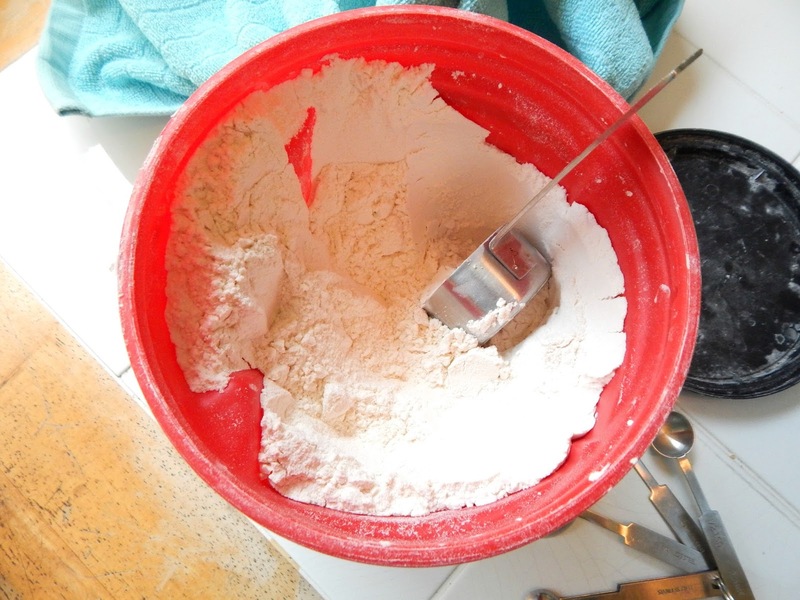 Here's my preferred method - which, incidentally, does not require any special tools. For written instructions, click here. 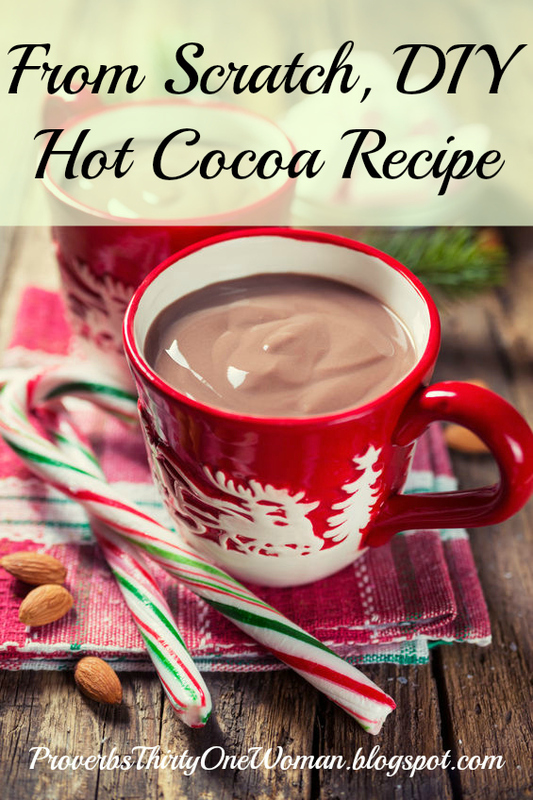 Recently, my kids asked for hot cocoa - one of their favorite winter treats. We were at Walmart, and sticking to my rule of reading all food labels, I picked up their favorite brand and read the ingredients list. I stopped reading at the second ingredient: corn syrup. Then I read every other hot cocoa label on the shelf. All of them contained corn syrup, plus a host of other icky ingredients. Sigh. When I got home, I got on Facebook and asked my friends if they knew of a brand of hot cocoa that didn't contain corn syrup. Some suggested Ghirardelli's, and one friend touted AhLaska Organic Cocoa Mix. But another friend said, "Why don't you make it from scratch?" I was a little embarrassed, because I'm that annoying person who's always suggesting making everything from scratch - yet it never occurred to me to do DIY hot cocoa. 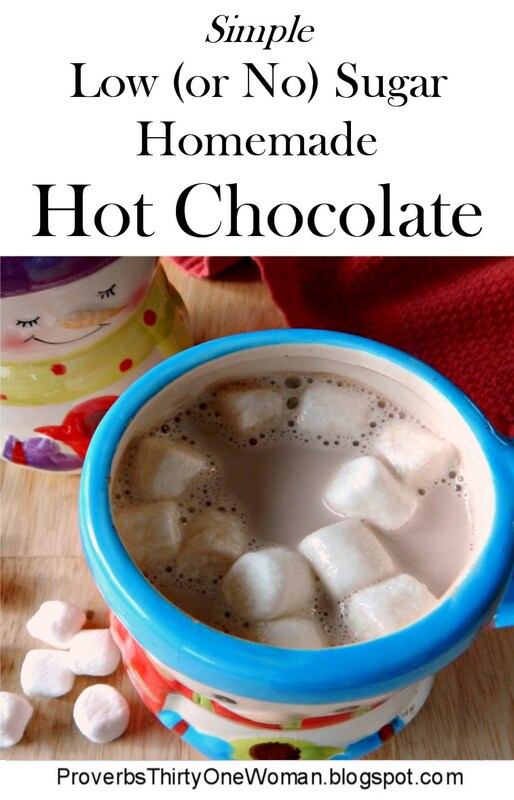 So I looked at a gazillion from scratch hot cocoa recipes, and finally settled on this one (from Epicurious). 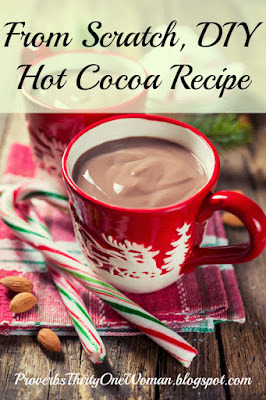 Incidentally, you can find recipes for making your own hot cocoa mix, too, but everything I saw was contained processed ingredients (like powdered creamer), so I decided it was better to make each batch fresh, with fresh dairy. Multiply this recipe as needed for the correct number of servings. 1. 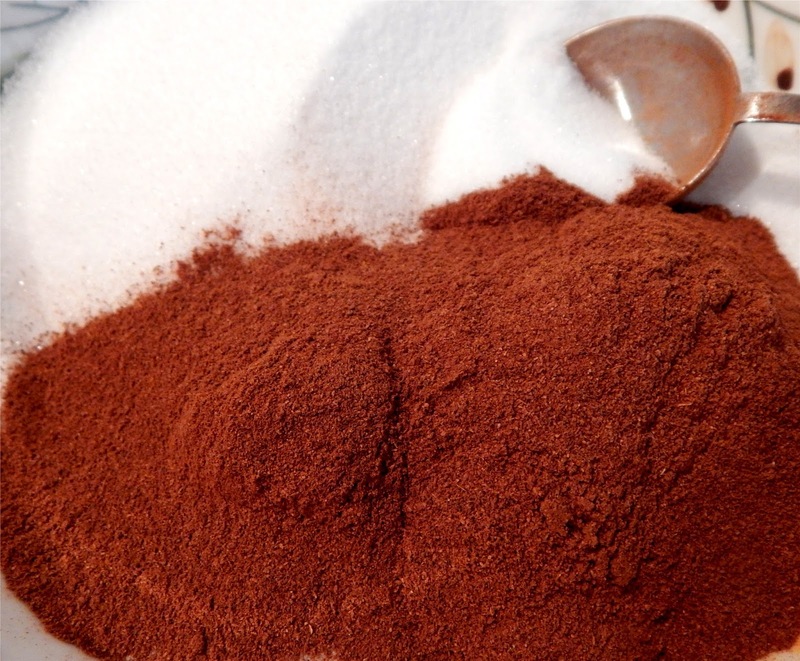 In a saucepan placed over medium-low heat, whisk together the cocoa powder, sugar, salt, and 2 tablespoons of milk until sugar is completely dissolved. 2. Whisk in the remaining milk/cream; whisk occasionally until the mixture is hot. 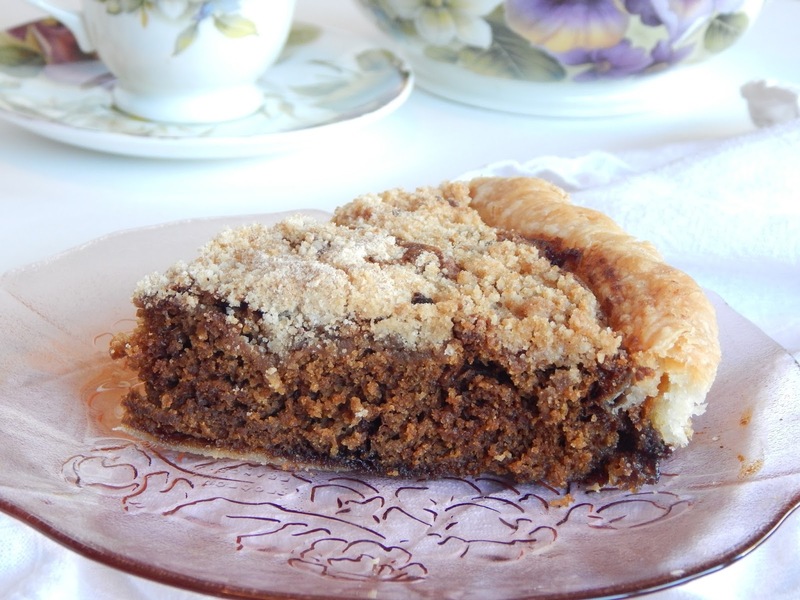 * When choosing sugar for this recipe, I prefer real cane sugar. That's because beet sugar, or sugar that doesn't mention its source, is usually GMO. Avoid agave, since it's proven the worst source of sugar you can eat. I also avoid Truvia, which is highly processed and full of questionable stuff. Real, pure, stevia may work for this recipe, but I have not tried it. * I use sea salt exclusively, because processed salt (any salt other than natural sea salt) is linked to autoimmune disease. * Check your vanilla extract to be sure it's the real thing, and not full of artificial ingredients. * Regular marshmallows are made from high fructose corn syrup. Look for organic marshmallows, which are usually made from real cane sugar. But most of all, enjoy! No matter how hard we try to eat healthy, we live in a fallen world, and our food will never be perfect! Eat the foods God provided through nature, but don't get stressed about every bite (or sip), friends. By the time I was 9 or 10 years old, I couldn't do much in the kitchen - but one thing I could do was make a batch of pancakes. This was the 1980s, and my mother (like most moms of the era) didn't make anything without a box. So in order to whip up a batch a pancakes, all I had to do was measure out some Bisquick and stir in some eggs and milk. Easy! Today, my 10 year old daughter can't do much in the kitchen, either. Because she's petite, she has a hard time lifting filled pans and seems to have a special talent for burning herself on anything hot. She has a desire to learn to cook, though - and I have dreams of one day being able to say, "This morning, why don't you cook breakfast?" Besides, cooking is an important life skill for all children. The trouble is, my daughter is still not very accurate at measuring. And because we avoid processed food, we make pancakes from scratch. That means I can't let her make pancakes without supervision...or does it? The fact is, it's easy to make your own pancake mix - free of preservatives and hard to pronounce ingredients, but still very handy for a quick meal. In fact, while it's really not hard to whip together from scratch pancakes, having a mix on hand does seem to make breakfast come together a bit more quickly. Besides, a mix means the kids can handle pancake making. To make your own Bisquick, all you need to do is take your favorite pancake recipe, mix up several batches, and pour it into a container. (More details on how to do that below.) Don't have a from scratch pancake recipe? Then steal mine! 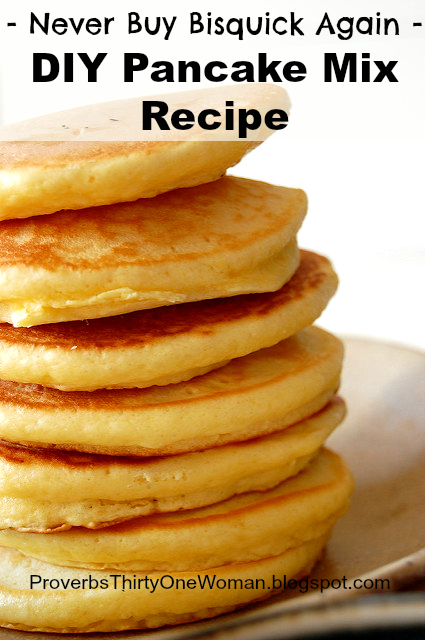 This is the from scratch recipe I use; my family prefers pancakes made with some wheat flour. We find them more flavorful, more filling, and more nutritious. However, if you prefer, you can replace the whole wheat flour in this recipe with white unbleached flour. 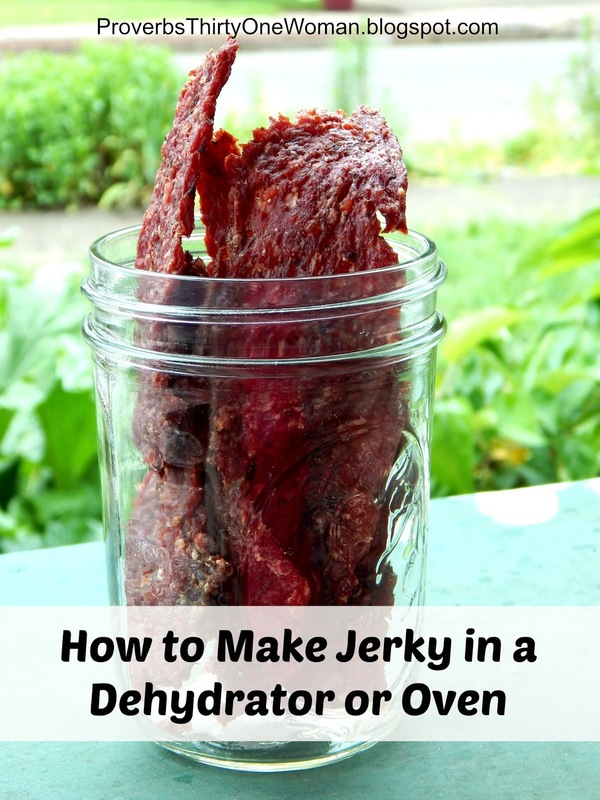 Blend together and pour into an airtight container. I use an empty (and well washed with white vinegar) coffee container, but a gallon sized canning jar works well, too. Mix well. 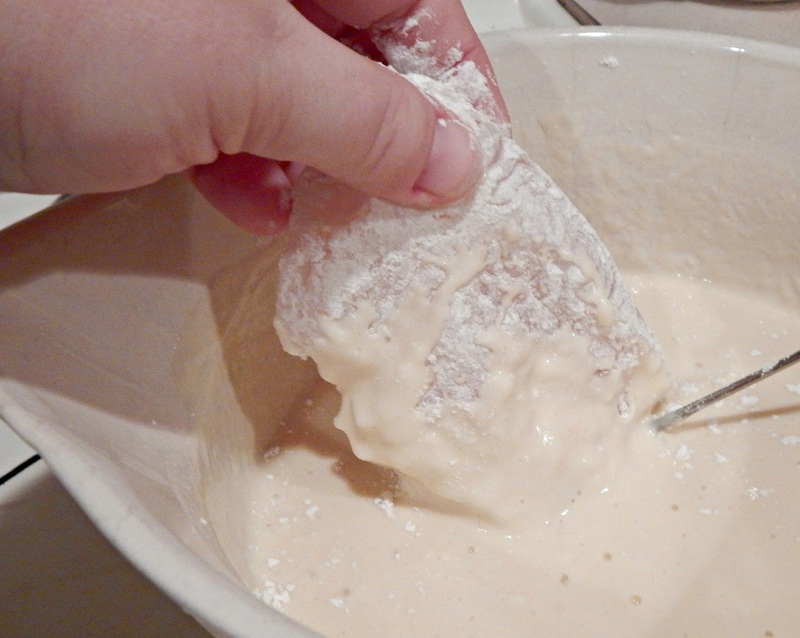 If batter seems too thick, add a little extra milk. 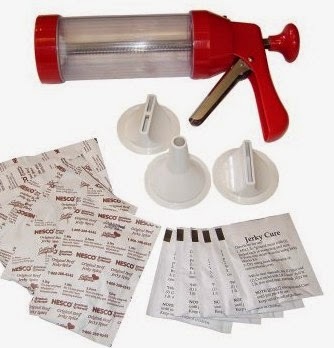 HINT #1: Have a reluctant cook or a child who needs a little extra help making pancakes? Make the job even easier by measuring out single batches of pancake mix into Ziplock bags! HINT #2: I often make more than one batch of pancakes at a time, then pop them in the freezer. Any time I need a speedy breakfast, I reheat the desired amount in the microwave or on a low setting in the oven. Learn how to freeze pancakes (and waffles) here. If you already have a from scratch pancake recipe you love, it's very simple to turn it into a mix. Just triple or quadruple the dry ingredients. An easy peasy way to do that is to use this online recipe calculator, which allows you to decrease and increase recipes. To find out how much of the mix you'll need for a single batch of pancakes, measure out all the dry ingredients in their single batch measurements, and place them in a bowl. Now remove the mixture from the bowl using measuring cups (start with the 1 cup size) and place them in another container, making note of how many cups the batch contains. Finally, remember to print out this measurement - plus the rest of the recipe - and tape it onto your pancake mix storage container. 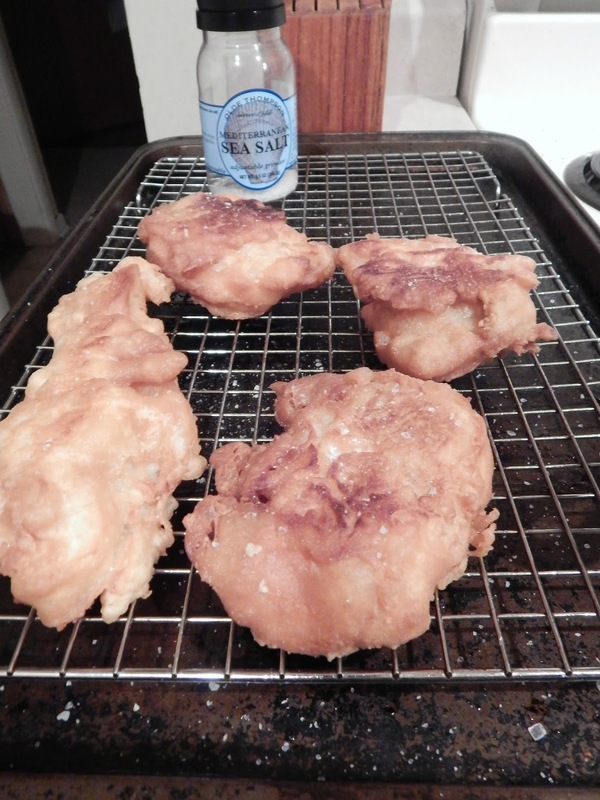 From time to time, my family likes to splurge a little and have some beer battered fish and chips. 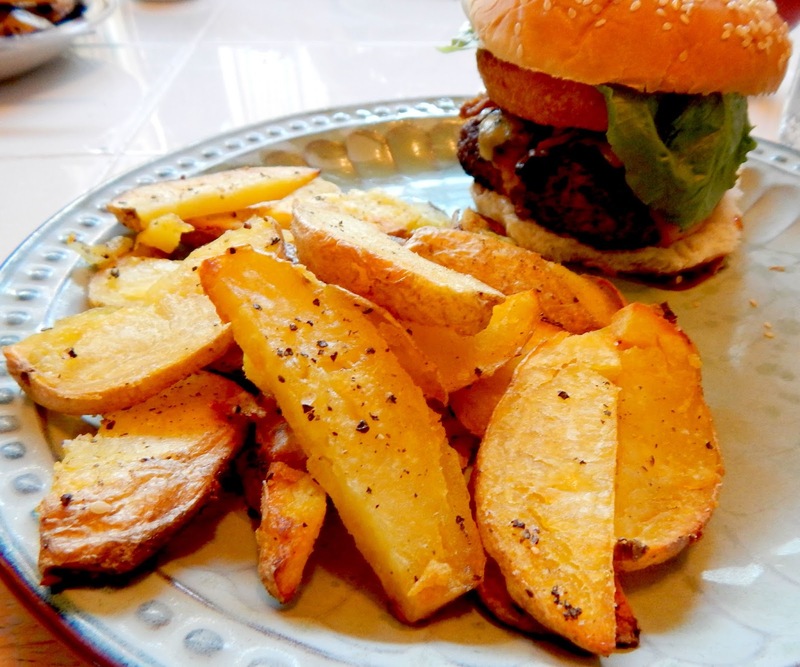 And, a little more often, we like to add onion rings to my husband's fantastic grilled burgers; it puts them over the top! However, when I developed non-alcoholic fatty liver disease, I soon learned that unhealthy oils were something I couldn't indulge in - even a little bit. Sadly, nearly all restaurants cook with unhealthy oils - particularly when they fry food. 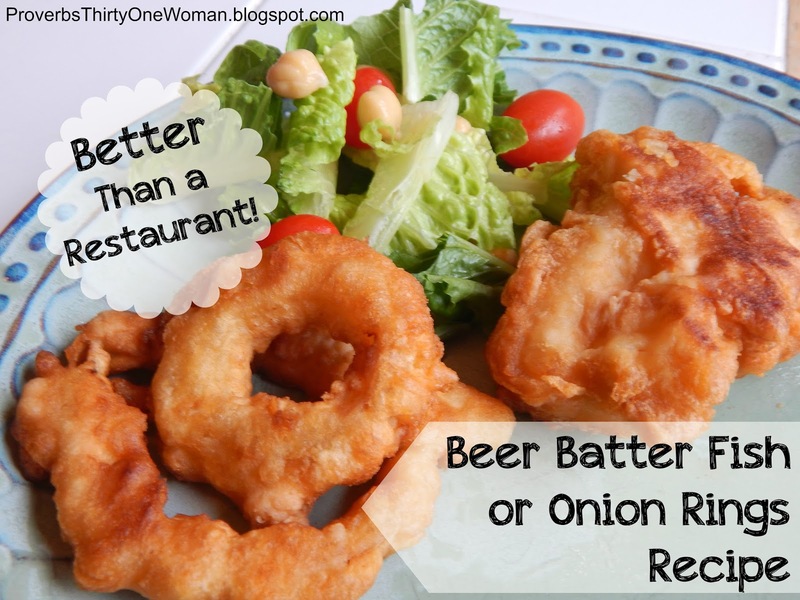 So recently, I've had to learn to make our own battered fish and onion rings. At first, I was apprehensive, but it turns out it's very easy to do - and far superior to anything I've ever had in a restaurant! You don't even need a deep fryer. You could probably use any beer you like. The original recipe (found in the now defunct Everyday Food magazine) called for light- or medium-bodied lager. I use cheap ol' Busch beer. Do use pure sea salt with nothing added to it, since processed salt is linked to autoimmune disorders - and salt with iodine added will taste "off." Oil choice is of paramount importance. In recent years, most cooks have taken to using vegetable or canola oil for frying. However, these are some of the most highly processed oils you can consume - and very good at clogging up your liver. On the other hand, the most commonly used healthy oil - extra virgin olive oil - is inappropriate for frying because when it reaches the appropriate temperature, it becomes carcinogenic. 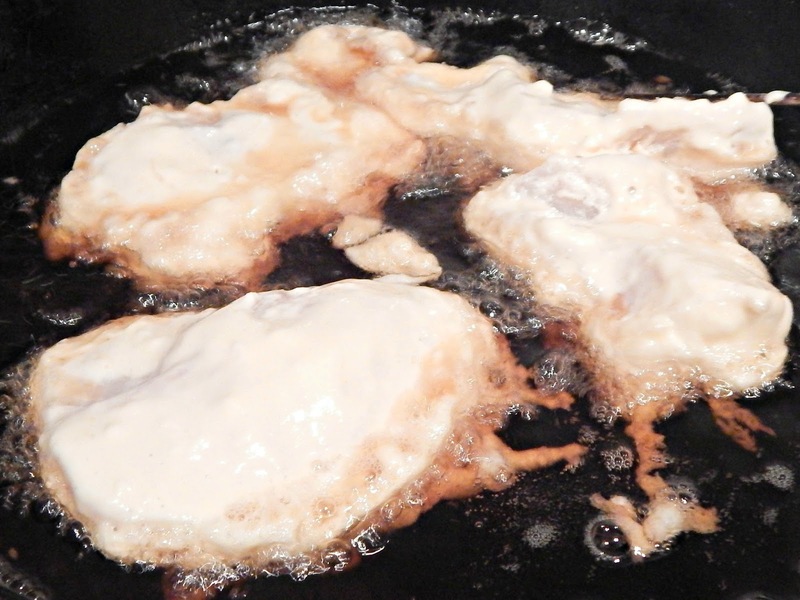 Refined olive oil, however, is considered an acceptable choice for frying. Personally, I use what my naturopath recommends: sesame oil. 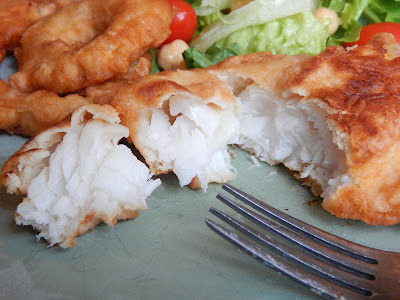 Also, while you do not need a deep fryer for this recipe, you do absolutely need a decent thermometer. I prefer to the probe type (like this), rather than the stick type, so I can place the tip in the oil the entire time I'm cooking, to ensure the oil stays at the appropriate temperature. 1. In a medium bowl, whisk the eggs until the whites and yolks are well blended. Whisk in the beer. Whisk in 1 1/2 cups flour and 1 1/2 teaspoons coarse salt. 2. 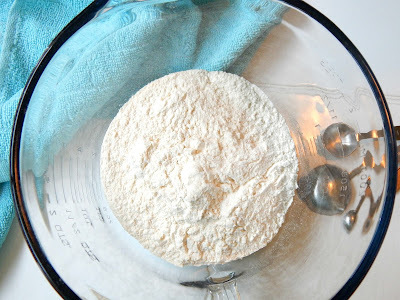 Pour 1 cup of flour into a shallow bowl. 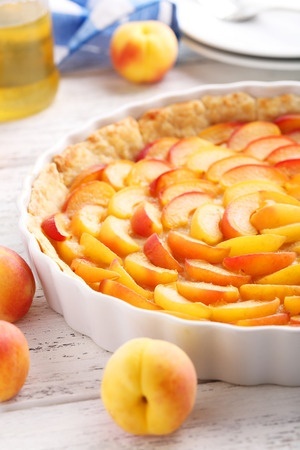 Place a wire cooling rack on top of a rimmed baking sheet and place near the stove. 1. Fill a large, heavy skillet with oil. It should come about halfway up the sides of the food. If you have one, I highly recommend using a cast iron skillet; otherwise, any heavy skillet will do. Turn the heat to medium and place the thermometer in the oil. 2. 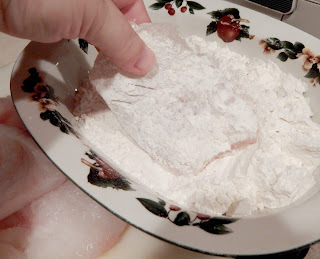 Once the oil reaches 375 degrees F., cover the food in the flour and shake off any excess. 3. Dip in the beer batter, coating well, and brushing excess away. 4. Gently place the food in the skillet. Don't overcrowd the skillet; it's better to work in small batches. 5. Cook for approximately 3 minutes. (Begin timing when the first piece of food goes into the skillet.) Be sure to adjust the temperature of the stove to keep the oil at approximately 375 degrees F. the whole time you are cooking. The temp will fluctuate, but if it goes too low, things won't cook quickly and crisply - and if the temperature goes too high, you'll risk burning the food - and the oil will begin to smoke. For best results, make small adjustments to the temperature of the stove. 6. Turn the food over, using tongs. Cook approximately another 2 minutes, or until the food looks deep golden. 7. Using tongs, remove the food from the skillet and place on the prepared cooling rack. Immediately season with salt. 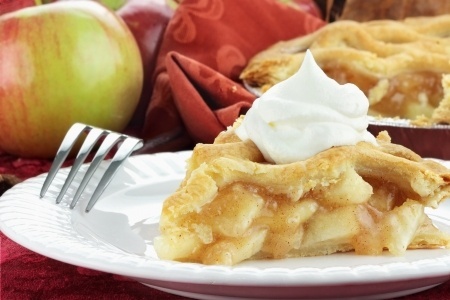 If necessary, keep the food warm in an oven set at about 200 degrees F.
6. In between batches, use a slotted spoon to remove bits of batter from the oil. I use yellow onions, because they are the staple in my kitchen and I always have them around - but you can use any type of onion you like. 1. Peel off the papery outer skins and slice onions into rings of whatever thickness you prefer. Place slices in a shallow bowl and cover with buttermilk. 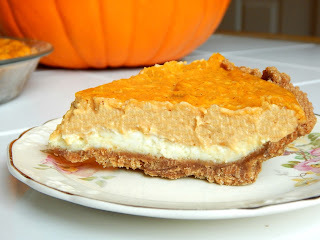 (It takes about 2 cups to cover the slices from one onion.) 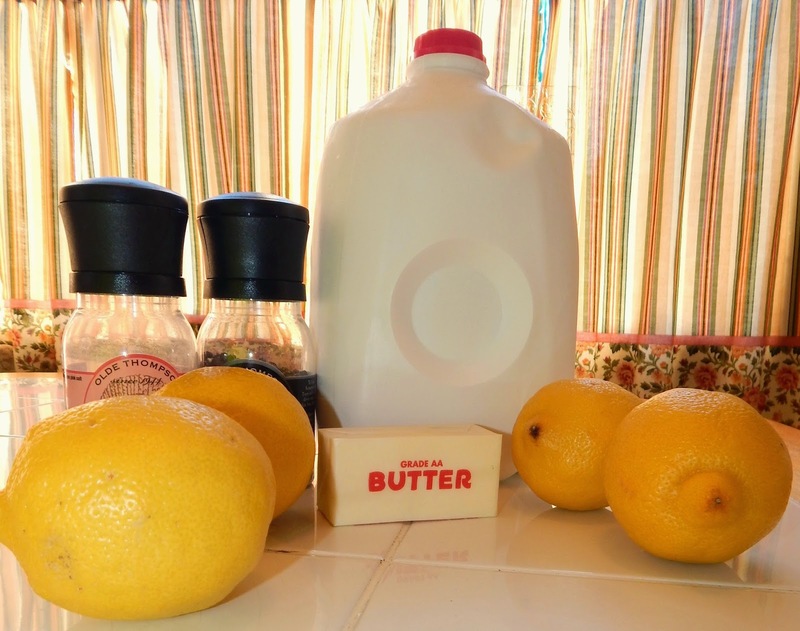 If you don't have buttermilk on hand, use regular milk with 1 tablespoon of white vinegar added to each cup. 2. Allow the onion slices to soak for 30 minutes. This step mellows the strong onion flavor and should not be skipped. 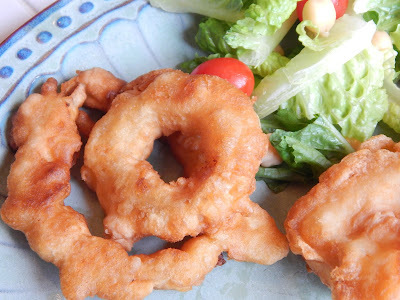 After half an hour, remove the onion rings from the milk, one by one, and follow the fish frying steps outlined above. My pie recipe cookbook is complete! 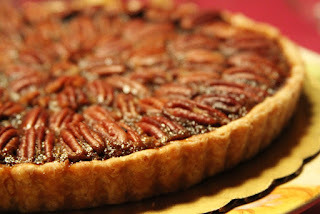 I had a lot of fun testing recipes - and my husband, kids, and neighbors thought it was tasty fun, too. 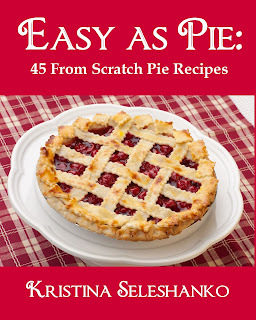 I think you'll find this cookbook does make pie making "easy as pie." 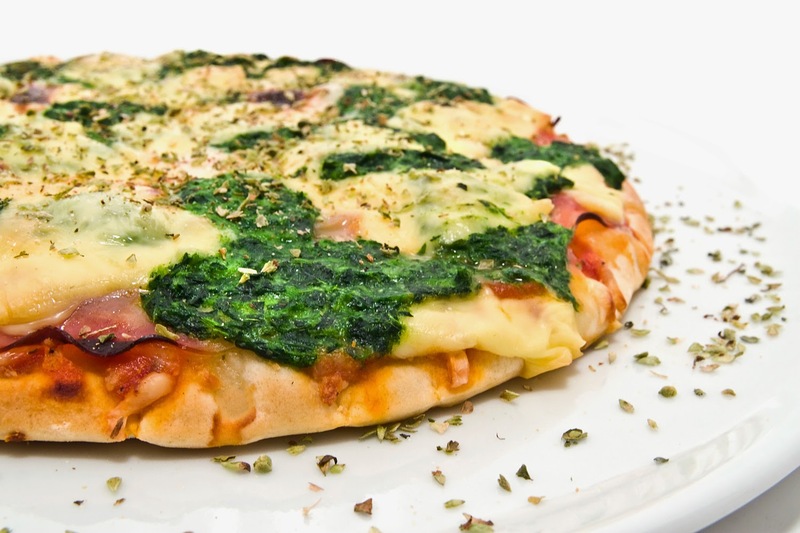 Recipes for four different types of crusts – including gluten free! 45 from scratch pie recipes, including cream pies, fruit pies, nut pies, vegetable pies, and more. Over 60 full color photos. 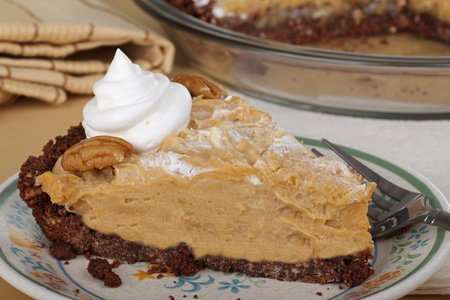 Tips for easy, no fail pie crusts. 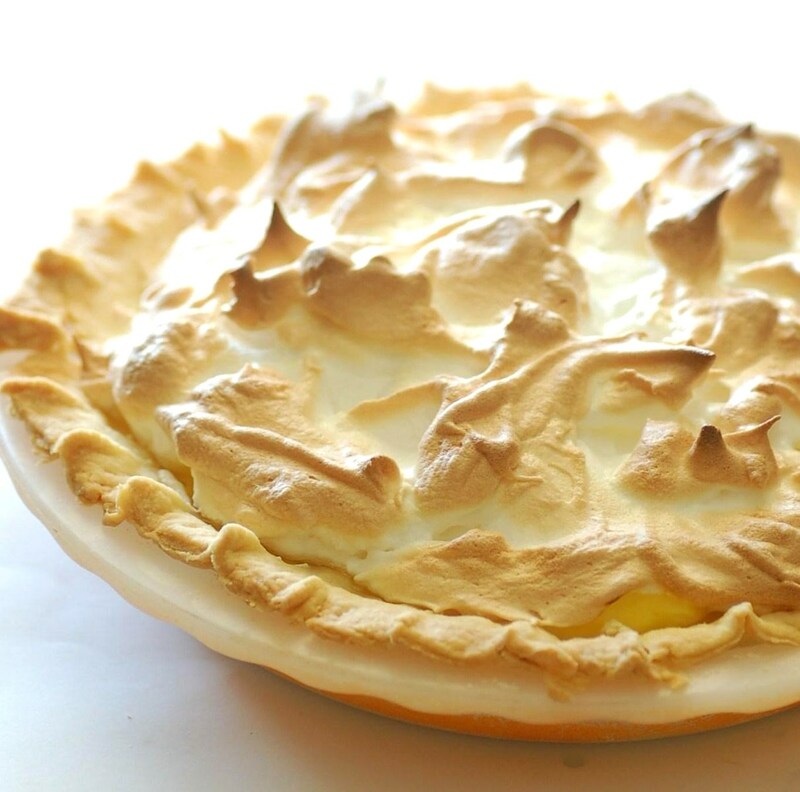 How to successfully make meringue. How "cutting in" ingredients makes the difference between a tender, flaky crust and a tough one. 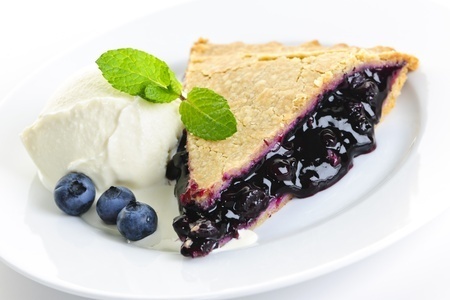 Blueberry, blackberry, raspberry, and mixed berry pies. 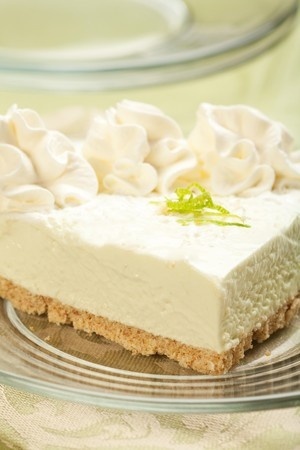 Lime, lemon, and orange pies. Peach, strawberry, pear, cherry (not from a can! ), apple, apricot, raisin, plum, and nectarine pies. 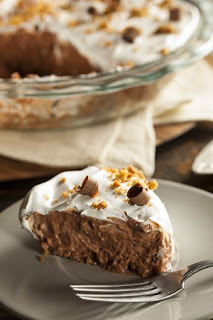 Banana cream, chocolate cream, and coconut cream pies. Pumpkin (not from a can! ), butternut, sweet potato, and rhubarb pies. Pecan, walnut, and peanut butter pies. 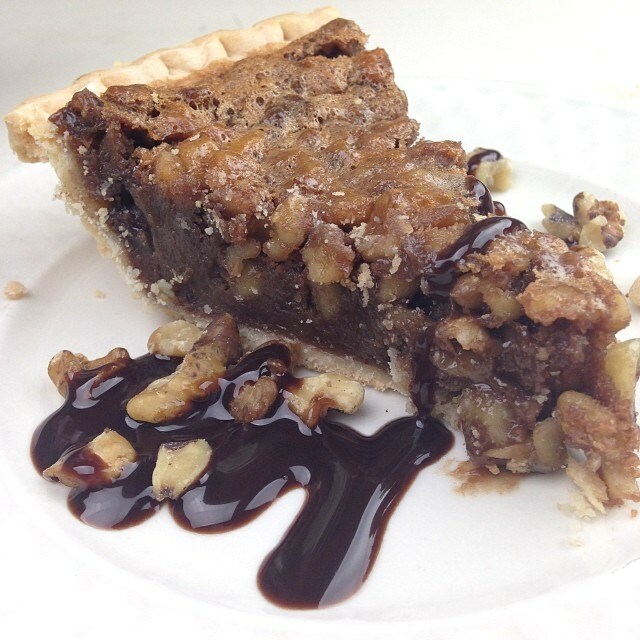 Plus other pies you may not have heard of, including green tomato, zucchini, green pumpkin, cookie dough, shoofly, and brownie pies! 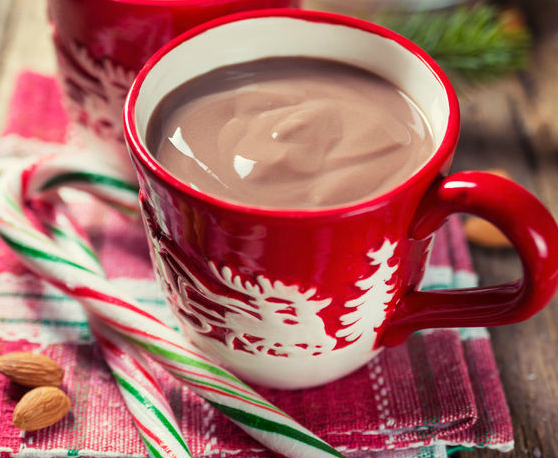 Perfect for the holidays - or any day of the year! Now available in both paperback (black and white interior) and Kindle format (full color interior). I hope you enjoy it! been experiencing tummy troubles. Knowing this was just a trial, I didn't want to invest in the many ingredients to make gluten free bread at home - but at the same time, I was constantly getting puppy dog eyes because the little guy was longing for bread. So I bought some gluten free bread. Sadly, not only was it expensive ($8 for a tiny loaf), but it didn't taste very good. My solution? I toasted and buttered the bread and sprinkled cinnamon sugar over it. A success! 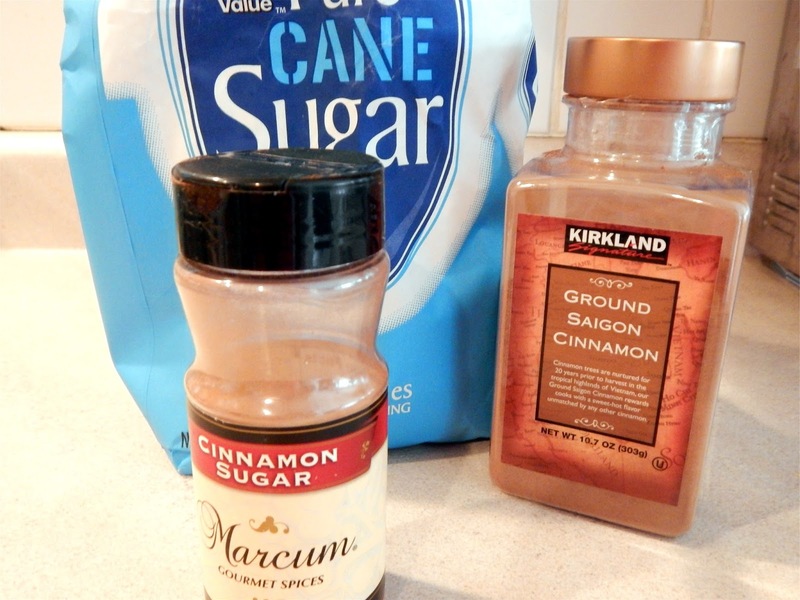 All you need is sugar, cinnamon, and an air tight container to store your blend in. 1. Find a container for your finished spice blend. I use a cinnamon sugar container I bought eons ago, but any glass jar with a well-fitting lid will work great. You could even use a Ziplock style bag. 2. Measure out 1/4 cup of sugar. I recommend cane sugar, since beet sugar or sugar of unknown origins is usually GMO. Pour the sugar into a bowl. 3. Measure out 4 tablespoons of cinnamon. Add it to the bowl. 4. 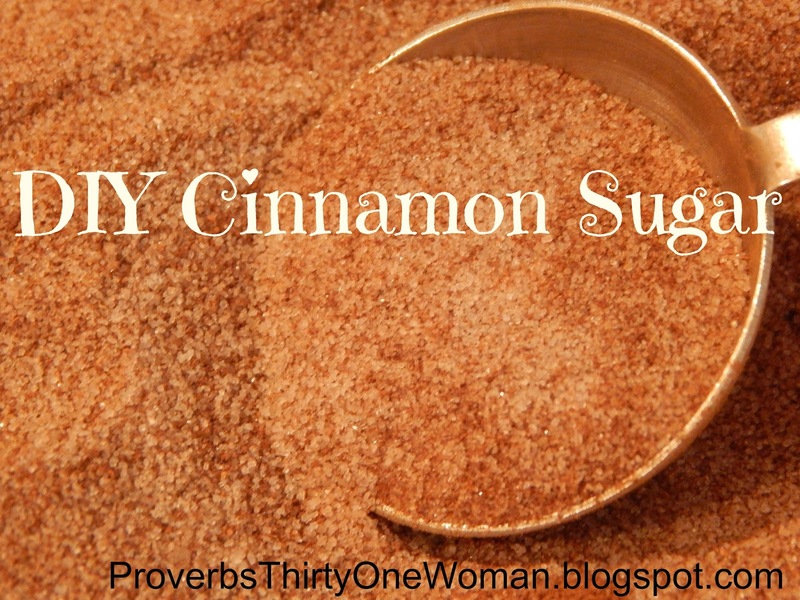 Stir the sugar and cinnamon together and transfer to your air tight container. If you're like me, you'd also better label the container or you may confuse it with taco seasoning or something equally yucky on toast. You can, of course, adjust these measurements to suit your personal taste. 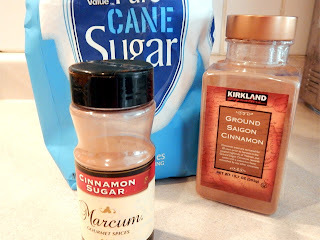 For us, though, this ratio of sugar to cinnamon is just right - not too sweet and not too "cinnamony." I call them steak fries, but they are actually pretty similar to jo-jos - except they aren't fried. So think of them as a cross between jo-jos and steak fries. (On second thought, who can even afford steak these days? Maybe I should call them burger fries, instead!) 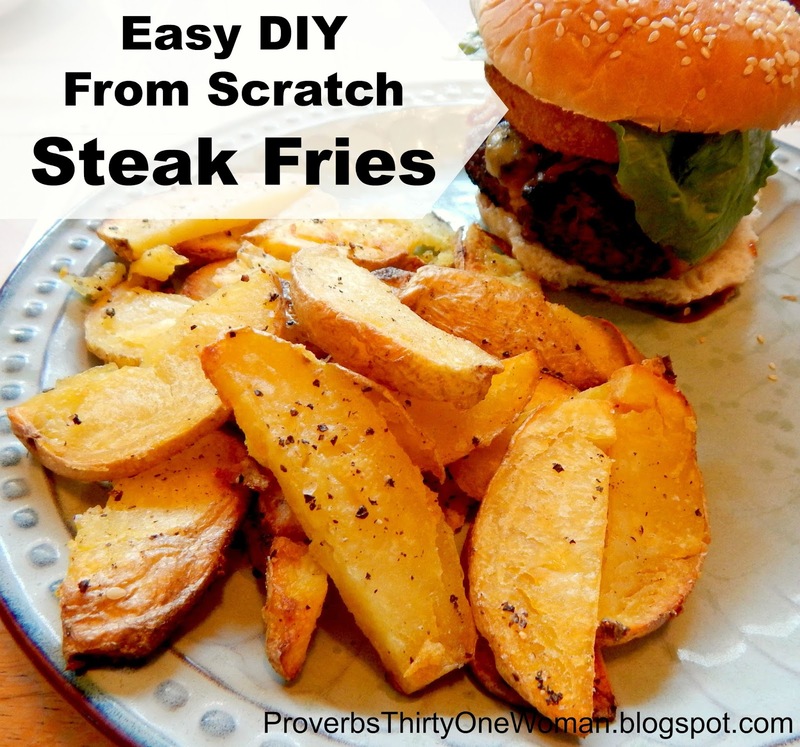 But whatever you call them, these fries are super easy to prepare and extremely yummy - soft on the inside, and crispy on the outside. 4. Allow the potatoes to cool enough so you can comfortably handle them. 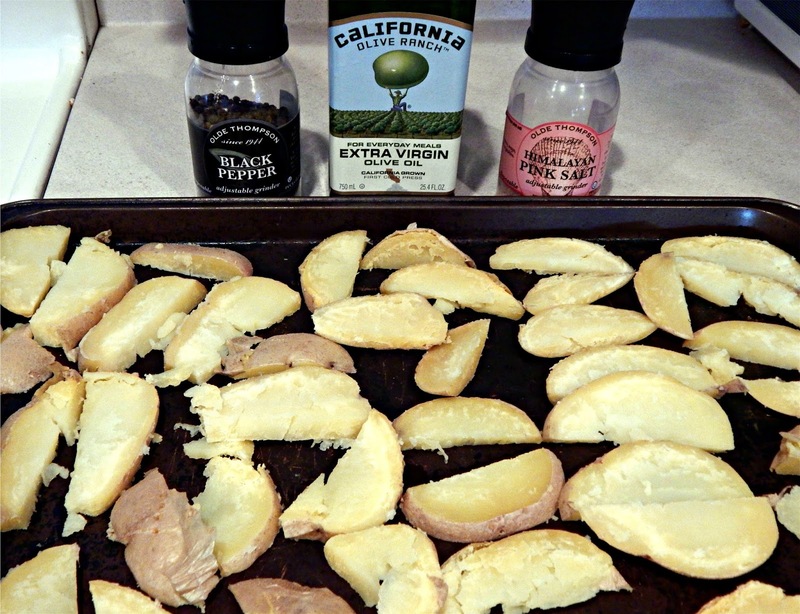 Cut each potato in half and place the cut sides down on a cutting board. Slice each half into wedges that are a generous 1/4 thick. 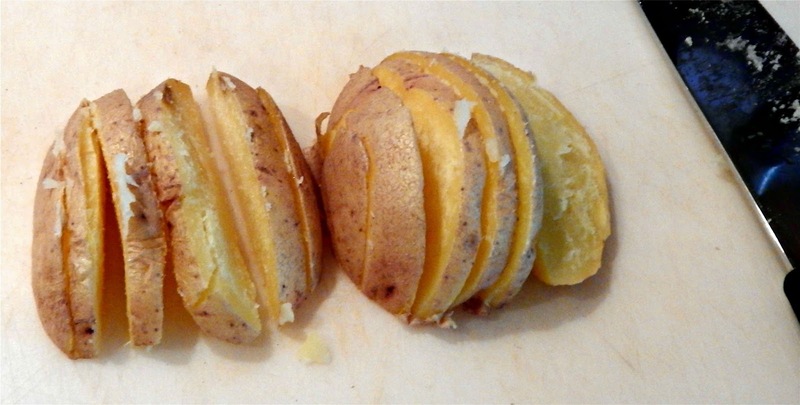 Slice potatoes a generous 1/4 in. thick. 5. 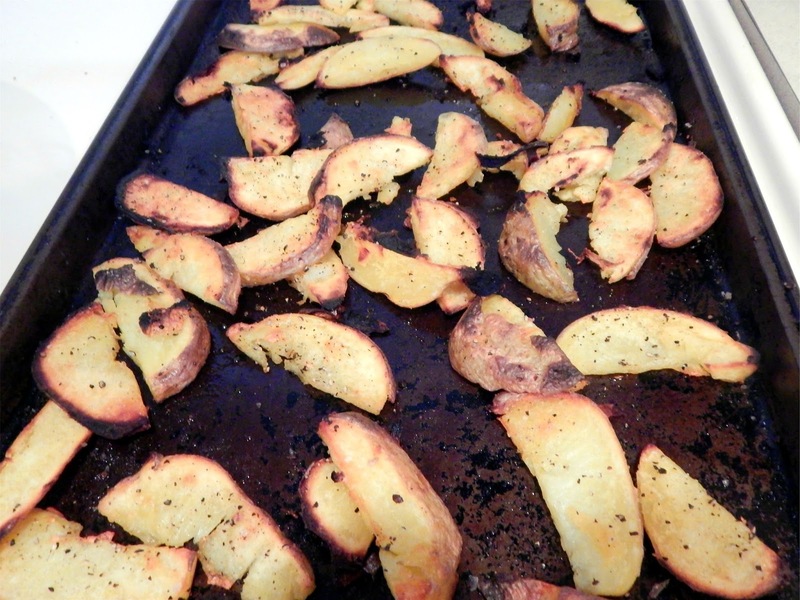 Place the wedges on a rimmed baking sheet. A few may fall apart; that's okay. Just make sure the wedges are in a single layer. Drizzle olive oil over the wedges. Turn the wedges over, making sure both sides are lightly coated with olive oil. (You can use spray oil, but it has added ingredients that may or may not be healthy.) 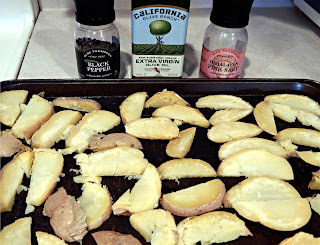 Season the wedges liberally with sea salt and freshly ground pepper. 6. 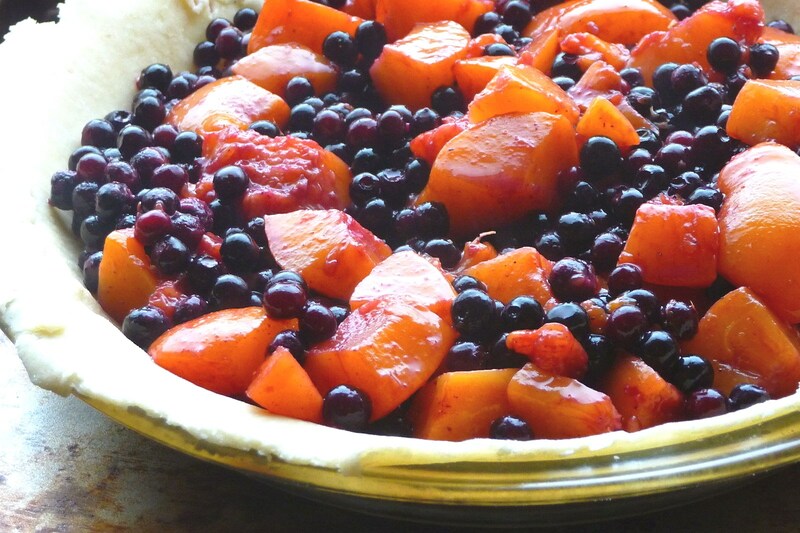 Pop the baking sheet into the preheated oven and bake for 10 minutes. 7. Now broil the wedges for about 5 minutes; remove from the oven and turn the wedges over. Broil for about 3 more minutes. Be sure to watch the potatoes carefully at this stage, or they may burn. When the wedges are golden brown and the skins bubbly, they're done. Feel free to serve these fries with catsup or homemade Ranch, but honestly - even my kids agree these fries don't need condiments! ingredients and a few tools, and attempted to make mozzarella - supposedly a good choice for beginning cheesemakers. Well, it was awful. Terribly grainy and rubbery. I figured it was probably the milk I chose to use (which I think was ultra-high temperature pasteurized, even though it wasn't labeled as such), and planned to make another attempt with a different brand of milk. It never happened. But it's always been in the back of my mind that I need to give it another go...even though I thought that meant buying all new rennet and other specialized cheesemaking ingredients. Then I saw the March/April '15 issue of Backwoods Home magazine. In it, Leah Leach writes about making a type of cheese I'd never heard of before: Farmer's Cheese. The recipe was instantly appealing to me because it required only ordinary, everyday ingredients: milk, butter, and lemon juice. Why Make Your Own Cheese? It's fun, for one. And it's always satisfying to make something from scratch. But my main motivation is the high cost of cheese, and avoiding preservatives used in grocery store cheeses. What Does Farmer's Cheese Taste Like? Nor surprisingly, the type of milk you use will change the flavor and texture of this cheese. Goat, sheep, or cow's milk are most commonly used for Farmer's Cheese, but assuming you don't have a source for farm fresh milk, it's fine to use ordinary, grocery store, pasteurized cow's milk. But you do not want ultra high temperature pasteurized (UHT) milk! This is milk that's pasteurized at a very high temperature, killing all the good stuff that helps you make cheese (or yogurt). Unfortunately, as I learned back when I tried to make mozzarella, not all UHT is marked as such. All shelf stable milk is UHT, and some refrigerated milk is, too. A hint that it's UHT? It has an expiration date that's considerably farther out than other brands, or it lasts an extra long time in your refrigerator. How much whey (liquid) you squeeze from the cheese affects the texture of the cheese greatly. Squeeze every drop out, and you'll have a dry, crumbly cheese (but it will still taste good). 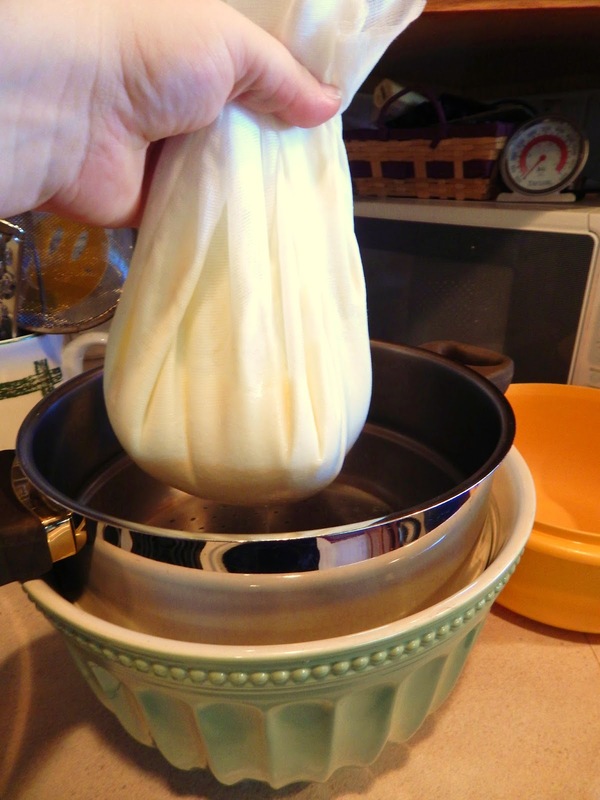 Squeeze too little out, and your cheese will be very soft and spread-able (and still yummy). 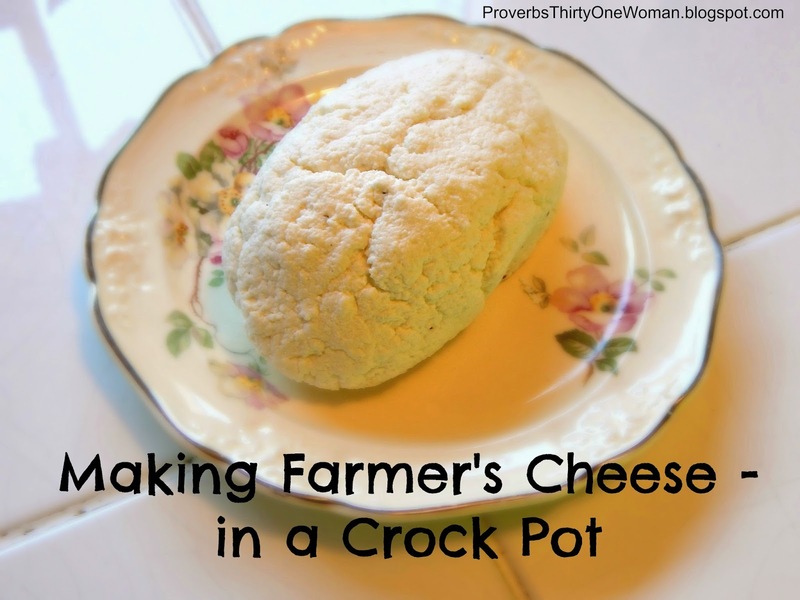 Most Farmer's Cheese is somewhere in between. In addition, how long you leave the curds (bumpy parts) and whey on the stove before you drain the whey affects the cheese texture and flavor. Some people insist on leaving the curds and whey undisturbed for at least 20 minutes; others don't wait at all. Some recipes also call for heating the cheese extremely slowly over low heat; this is mostly about flavor. 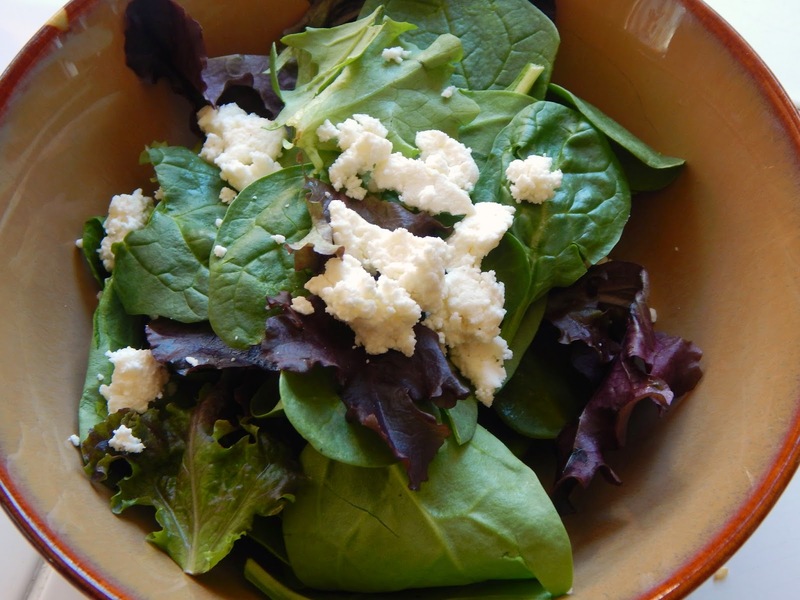 Farmer's Cheese on a salad. Finally, Farmer's Cheese is sometimes seasoned with herbs, citrus zest, or garlic. These can be stirred into the cheese before it's shaped into a loaf, or you can roll the loaf in them before chilling the cheese. So knowing these things, I decided to try the Farmer's Cheese as exactly laid out in Backwoods Home. I used store bought, pasteurized whole milk, fresh lemons, and a minimum of seasonings. When I got to the stage where the curds and whey separate, I thought I'd failed. I couldn't really see that the milk had separated. 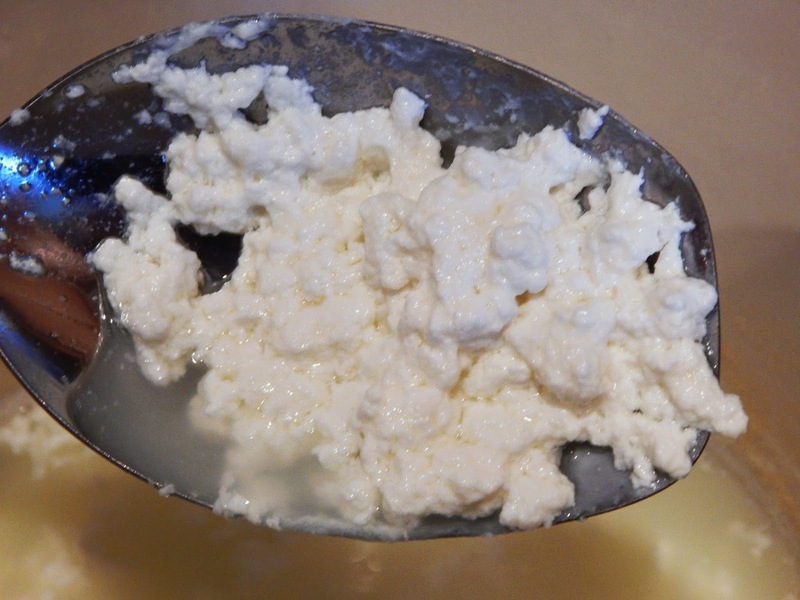 I continued with the process of cheesemaking, however, and ended up with a tasty - though quite soft - cheese. 2. Turn off the crock pot and remove the lid. Lift the crock out of the metal shell of the crock pot. Stir the milk. 3. Add about half the vinegar (or the lemon juice from two lemons - which you have in one bowl). Stir. 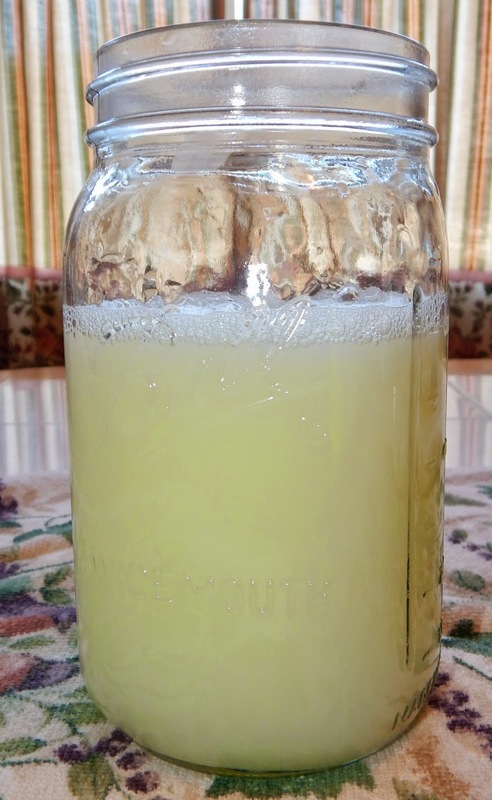 If the curds (the white, lumpy parts that look like cottage cheese) and the whey (the liquid) don't separate, add the rest of the vinegar or lemon juice. 4. Line a colander with four layers of cheesecloth (unless you have the high quality stuff that's woven very tightly, in which case you can use two layers) or a flour sack dishcloth. Place the colander over a large bowl. Carefully pour the curds and whey into the lined colander. Take up the edges of the cloth, turning it into a sort of bag. Use a large spoon to press down on the cheesecloth bag, making the whey stream out and into the bowl beneath the colander. Be careful; the curds and whey are hot! Taking up the edges of the cheesecloth. 5. 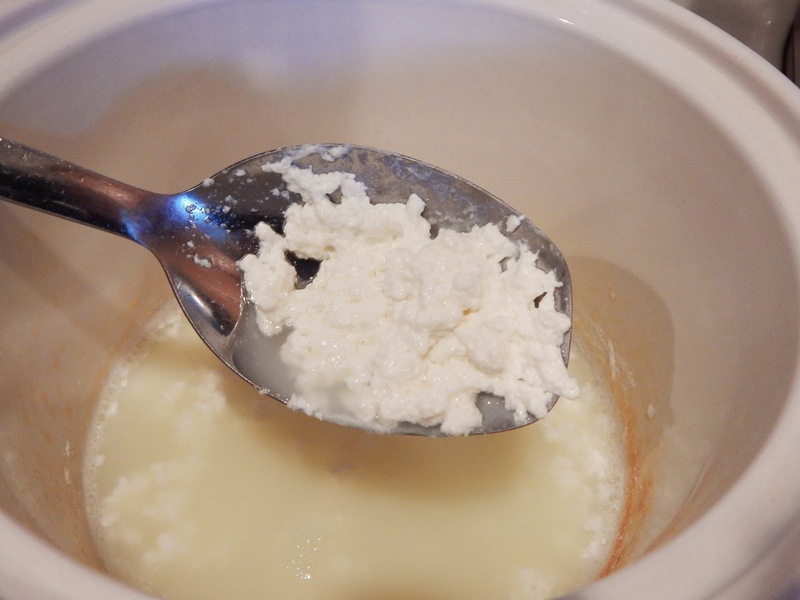 When you're satisfied that most of the whey is separated from the curds, empty the curds into a small bowl. Add the butter, and, using the back of a spoon, press and mix the butter into the warm curds until the butter is melted and well blended. At first, the mixture will probably feel rubbery, but just keep mixing and soon the cheese will soften. 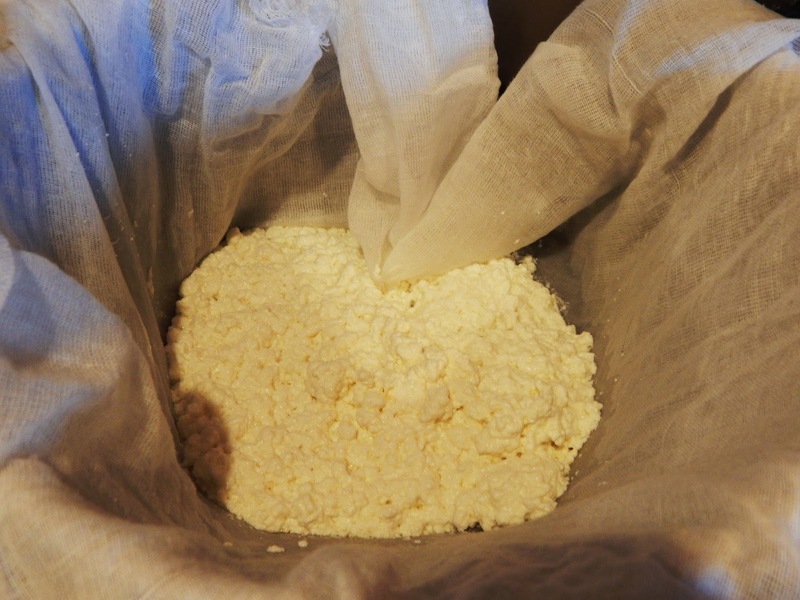 The whey is now strained from the curds. 6. Season with salt and pepper, then shape into a loaf. Cover with plastic wrap or place in an air tight container in the fridge. The cheese will last at least one week - perhaps two. It is fine to double this recipe. They whey from Farmer's Cheese is called "sour whey" or "acid whey" because you've added acid to it. Whey is packed with protein, vitamins C, B, E, iron, calcium, magnesium, potassium, zinc, phosphorous, copper, selenium, and manganese. This post was featured at the Homestead Blog Hop.